Pandora's old pay service was nothing to write home about; or more accurately, it was nothing to pay for. 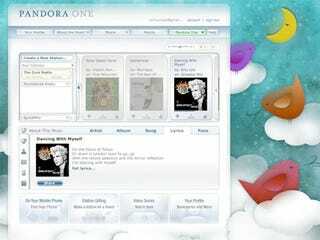 Pandora One, their new, $36/y premium option, at least tries to give you your money's worth. With Pandora One, which is available from today (sorry, still only in the US), you're mostly paying for one thing: no ads. But unlike their old premium service, this promise really means no ads—no ads on their website, no ads in their audio streams, and no ads in third-party apps, like their popular iPhone client. And about those clients: now there's an official desktop app, built on the cross-platform Adobe Air. According to TechCrunch, it's a bit minimalist, but good. In addition, Pandora One provides an option for high-quality 192kbps streaming, which is a boon to anyone who uses their PC as a home stereo. Pandora One also eliminates the nagging timeout functions, which would cut off your stream after a set period of inactivity.